After being a coach at CrossFit South Brooklyn in NYC for 6 years I moved halfway across the country to open my own affiliate, CrossFit Lumos, in Austin, TX. This series will chronicle my experience opening the gym and what I am learning along the way. This article is the final piece of the adventure, before I’m a real live gym owner. Part 1. Part 2. Part 3. Part 4. Part 5. Part 6. Part 7. Part 8. Part 9. Part 10. Part 11. Part 12. Part 13. One day, about a year after CrossFit Lumos opened, I sat down in front of my computer to knock through the day’s administrative tasks. 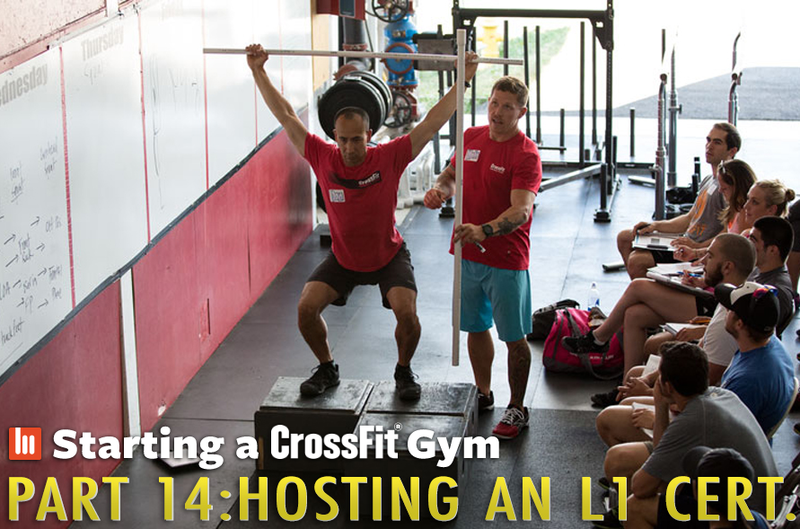 I noticed an email from CrossFit HQ that simply said: “Host Request: L1 June 2-3 Austin, TX.” I couldn’t believe it, my little gym, barely a year old, was going to host a Level 1 Certification! It didn’t take much thought to agree to host the cert. I owe my career to taking my Level 1, back in April of 2010- it started me on the journey that eventually led to me opening Lumos. That Level 1 opened my eyes to what CrossFit was and what it could be- the power it could have on not just my own life and fitness, but the lives and health of the people around me. If I had “caught” the bug when I started CrossFit, the L1 was when it turned into a fully systemic phenomenon. I recertified in 2015 and loved it just as much as my first time- with about four years of coaching experience under my belt, the cert was both familiar and different. I noticed and appreciated different aspects of the weekend, while still marveling at the seminar staff’s ability to convey so much information so clearly and succinctly. Immediately after agreeing to host, I panicked. I had been to two L1s and an L2, and knew gyms that had hosted before- they were all BIG gyms- 5,000 square feet or more. Maybe HQ didn’t know I had a small gym- barely 2,500 square feet. We have plenty of equipment for our size, but the supplied list called for LOTS more. Also, they wanted to do a cert in June… in TEXAS. It would undoubtedly be around 100 degrees all weekend, and while my gym has fans and roll up doors and great cross ventilation, it doesn’t have AC. I reached out and HQ assured me it was fine- they were doing some smaller certs, so instead of the normal fifty-ish people, mine would be around half that, with about half the required space, equipment etc. The heat would be fine- which makes sense- otherwise nobody could ever get certified in my area during about half of the year. There was some equipment I’d need- more chairs, a GHD (which had been on my list anyway), so I started knocking away at the list, and before I knew it the weekend had rolled around. About a week before the cert I got the names of the seminar staff who would be presenting, and then got a personal email from the weekend’s “flowmaster,” Abi Grove. We nailed down the final details, and I got to the gym Saturday morning to open it up for them and make sure everything was ready to go. Abi, Dave, and Pablo were shining examples of the CrossFit HQ team- hyper-knowledgeable, dedicated, and friendly beyond reason. I had one of my members taking the cert, so I was able to pop in and out to make sure everything was ok while still getting other stuff done that weekend. One thing I was adamant about was that I didn’t want to inconvenience my members by hosting- my gym is normally open Saturdays and Sundays and I didn’t want my people to feel like they were being left out in the cold. I approached the weekend as an opportunity to do stuff we wouldn’t normally do in the gym. On Saturday we ran a 5K- a phenomenal test of fitness (and the most programmed workout on CrossFit.com/Main Site) that often gets overlooked when programming due to perceived value to members or simply because people are wimps about running 🙂 Sunday we did a fun partner workout in the park which consisted of sandbag runs, lunges, and burpees over the sandbag, and then had a Field Day where we played Volleyball and Spike Ball. I’m planning something even more involved for our next L1 weekend! It was awesome seeing the seminar staff do their thing again- they are so polished and obviously care so much about what they do and the message they are helping to spread. Even better was meeting all of the folks who had driven from all over Texas (which is like driving from 4 states over in just about anywhere else in the US) and were super excited to get started on their own journey. I answered lots of questions about opening a gym, hiring coaches, buying equipment- basically everything this article series is about- and gave my business card to anyone who needed help. I hope I can pay forward what this community has done for me to the next generation of fitness fanatics. Before I knew it, the weekend was over. After some high fives and hugs, the seminar staff and participants went back to their “real lives.” I tidied up the gym as things had been moved around to best facilitate the flow of the seminar and seating, and began to think about how to prepare for my next time playing host so that it could be an even better experience for the staff, participants, and my members. I can’t wait.